DIAL: Omega grey with red/black subcounters specially to read 45-minute intervals. Dial singed 'TIFFANY & CO'. White, blue and red ‘Roulette’ 24 hour rotating inner bezel. Owner's initials engraved on the caseback. NOTES: This is the only Tiffany & Co original double signed Soccer Timer we have ever observed. 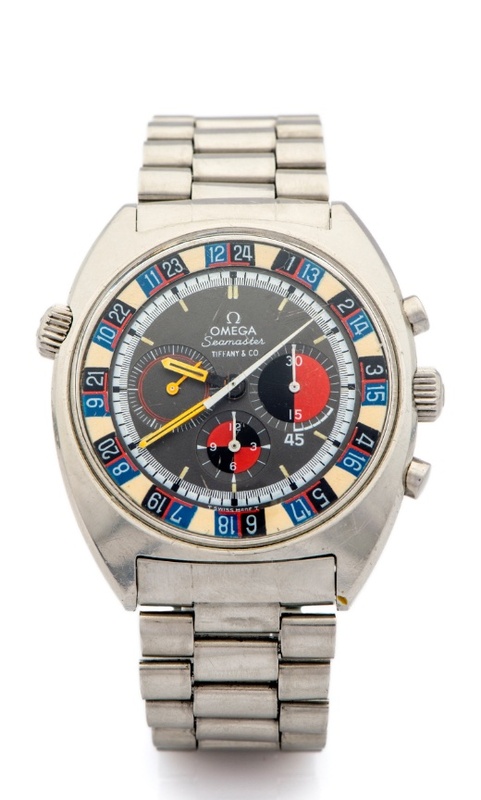 Along with one Speedmaster, these double signed Omegas are extremely rare. The watch includes Omega Archives extract with mention of the Tiffany & Co. delivery and signature.